The Highlander Band competition season began on Sept. 22 with the Plano Drumline Competition. HPDL won First Place Overall! They were also awarded captions for Best Snares, Best Tenors, and Best Front Ensemble. Other standouts were Nick Chang and Zack Shawver, who both earned second place for their original solos. Congratulations HPDL -- what a great way to start the 2018 competition season! The Highlander Band kicked off its Blue Out BBQ with the Band event Sept. 8. The festivities took place at the Fans United Shop located at the Shops at Park Lane. Blue Out shirts were handed out during the event along with raffle prizes that included four tickets to a Dallas Cowboys game. To top it off, the HPHS drumline performed inside the store. Band members would like to thank everyone who came out to the event and Fans United for opening their store for the event. Highlander Band Oboist Peter Davies has just returned from his second summer touring with the National Youth Orchestra of the United States of America (NYO) with guest conductor Michael Tilson Thomas and guest pianist Jean-Yves Thibaudet. NYO, sponsored by Carnegie Hall and free to all participants, selects the best young players from across the country. Following a three-week residency in New York with leading professional orchestral musicians, the NYO performed its annual concert at Carnegie Hall followed by concerts in some of the world's great concert venues in Taipei, Shanghai, Beijing, Seoul, and Daejeon. Congratulations to Peter Davies for finishing in third place in the Blount-Slawson Young Artists Competition in Montgomery, AL. This is one of the most prestigious youth competitions in the country for talented string and wind musicians. The first place winner, a violinist, also won the concerto competition with the Chicago Symphony Orchestra. Peter is in very good company! Peter submitted a recording of the Mozart Oboe Concerto to qualify for this competition. The preliminary round had about 80 musicians; ten were selected for finals. The finalists performed their concertos for an audience and ten (yes, ten!) judges. They were all fabulous! It is very difficult to compete against string players because their instruments have a huge range, can play more than one note at a time, and are very versatile. Peter's artistic presentation won over the audience and judges alike. It was very exciting to meet all these talented musicians. Congratulations, Peter! The Highlander Band placed eight students in the All State Band, breaking our previous program record, set last year. The Highlander Band also placed the highest number of students of all 5A bands in our area in the All State Band for the second straight year. Look at the Highlander Band! Save the Date: We’re Going to STATE! Huge congratulations to the Highlander Band for advancing to the 5A UIL State Marching Contest!!! This is the first time in the Highlander Band’s 90+ history to go to State! They will perform last in prelims in the Alamodome (San Antonio, TX) on November 8th at 5:30 P.M.
For tickets, please click here. If you cannot be there in person, sign up for live stream coverage. The Highlander Band claimed its first Grand Champion title after competing against numerous 5A and 6A schools on Oct. 7 at the Midlothian Marching Showcase. While the program has earned a number of class championships over the last four years, the band has never won a large marching contest until now. They also won caption awards for best general effect, best marching, best winds, and best percussion. The Highlander Band will compete against other 5A schools Oct. 19 in the UIL Region Marching Band Contest in hopes of advancing to the UIL Area competition Oct. 28. As many of you may have heard, the HPHS Percussion Ensemble won the 2017 Percussive Arts Society - Call for Tapes! 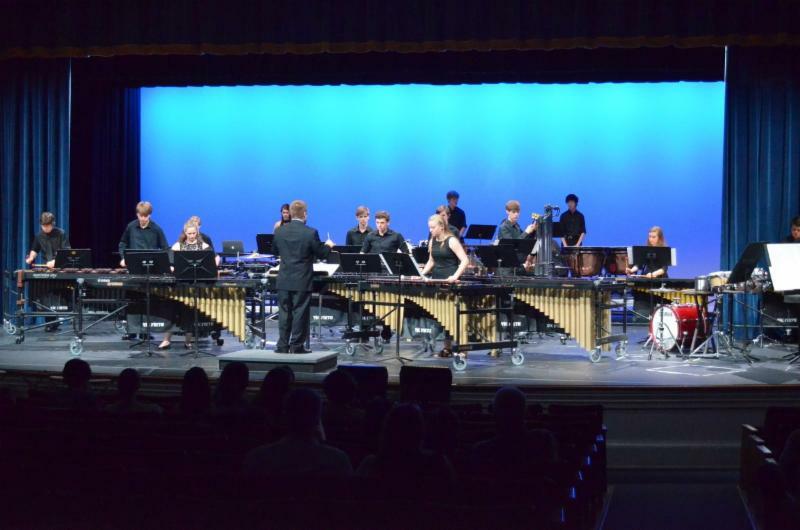 This past spring, the Highlander Percussion Section submitted recordings of our most advanced musical selections that were then judged by a panel of collegiate professors and professional percussionists, and HP was selected as one of the winning ensembles! This is a HUGE honor for our students and reflects their incredible dedication and skill level. HP was one of only three high-school percussion ensembles to be selected out of numerous of submissions, and we now have the honor to perform at the Percussive Arts Society International Convention (PASIC) in Indianapolis, November 2017! This is the largest and most prestigious percussion contest in the US. To be selected is the highest honor an ensemble can receive in this field. Other notable groups that will play at PASIC 2017 include: The Blue Man Group, The China Conservatory of Music, The Eastman School of Music, Michigan State University, and Northwestern University. This is a really big deal and the performance of a lifetime for our students. The Highlander Band program is very fortunate to have the incredible support of the Highlander Band Boosters, but trips of this nature are impossible to plan for in advance and require funding beyond what is raised for the band's annual budget. Therefore, we are raising funds specifically to help get our students to Indianapolis as they prepare to perform an outstanding showcase concert and have an amazing musical experience. Click this link to support HP Percussion on our trip to Indianapolis and PASIC! Any amount helps! Thank you! HP Percussion Win the 2017 Percussive Arts Society - Call for Tapes! HP Percussion is one of only three high school percussion ensembles selected to perform at the Percussive Arts Society International Convention (PASIC) in Indianapolis in November 2017! HP Percussion will perform a 50-minute showcase concert for more than 5,000 music educators, composers and performers attending the PASIC. 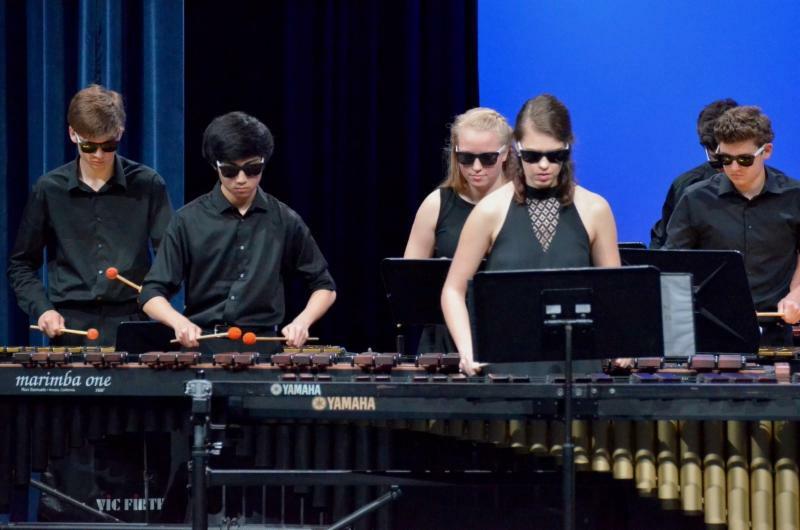 HP Percussion submitted recordings of our most advanced ensembles this past spring that were judged by a panel of collegiate professors and professional percussionists, and HP was selected as one of the winning ensembles! This is a huge honor for our percussion program and its director James LaBrecque! The PAS Call for Tapes is the largest and most prestigious percussion contest in the United States. To be selected is the highest honor an ensemble can receive. Congratulations to the 2016-2017 Highlander Band Wind Symphony and director Reagan Brumley for placing 4th in the State in the Honor Band Competition, the state championship for concert bands in Texas! To enter the competition, three selections, including one march and two symphonic works, are recorded and submitted. Each selection submitted must be a continuous performance that was recorded at a concert, festival, or contest. All movements submitted of a multi-movement work must be from a continuous performance and performed in the order of the printed score. At each level of the competition, five adjudicators that have no ties to the bands competing listen to the recordings without knowing the identity of the bands they are rating. All adjudicators are either leading university conductors or high school directors with long track records of success at the state level. Across the state, 82 bands advanced to the regional honor band competition. Out of those, 58 bands progressed to the area competition. Sixteen 5A bands were then selected to compete at the highest level for the state championship. The Highlander Band ranked first place in its area. This is the first time in history that the Highlander Band has advanced to the state finals level in the Honor Band Competition. Congratulations to the Wind Symphony for such a significant accomplishment! The Highlander Band named Emma Brunk, Cameron Poe, and Sydney McDuffie as drum majors leading the 150-member band during the 2017-2018 school year. 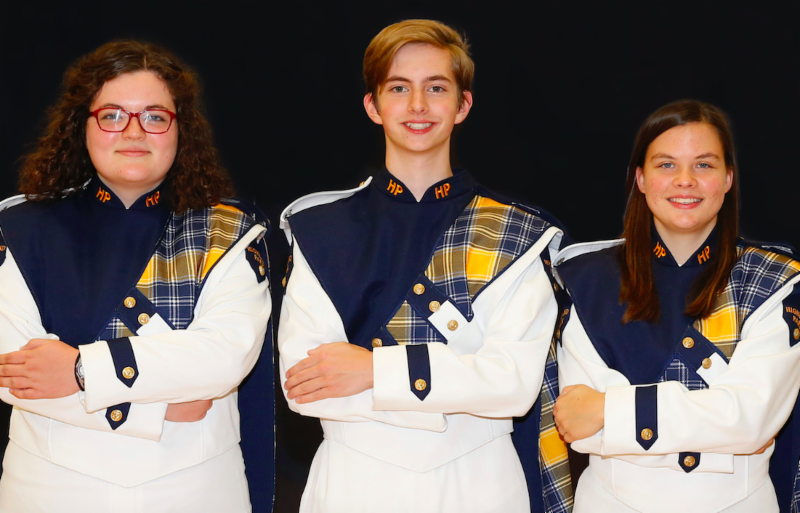 The drum majors began working with the band at the beginning of August to prepare to take the field at the first Highland Park Scots football game. To prepare, the drum majors attended the SASI Drum Major Camp at the University of Houston this summer, where Senior Sydney McDuffie won the Outstanding Conductor award. 2017 Wind Symphony Advances to State Honor Band Competition! For the first time in Highland Park history, the Highlander Band Wind Symphony advanced to the State 5A Honor Band Competition. Highland Park is one of only sixteen 5A bands advancing to the State Competition this year, after the Wind Symphony recording placed first in the 2017 Area D Honor Band Competition. Reagan Brumley, Director of Instrumental Music for HPISD, said, "I'm so proud of our band. These kids pushed SO hard to the end of the year and I am overwhelmingly proud of them. Doesn't hurt to work with the all-star staff of Will Parks, Jimmy LaBrecque, Lara Whitehouse, Tj Emsley, Cindi Sobering, and Danny Martinez!" In Texas, the state is divided into 32 music regions which roll up to 8 areas. This year, 58 bands advanced from the Regional Competition to the Area Competition, and 16 bands now advance from the Area Competition to the State Competition. Highland Park is in Region 20, Area D.
Congratulations to the 2016-17 Wind Symphony and director Reagan Brumley on their selection to the Area Honor Band competition. On June 5, judges from around the state selected two bands, Highland Park and Waxahachie, to advance to the Class 5A Area competition. The selection was made on the basis of recordings made at UIL and recorded concerts. The other three Regions in our Area will each select up to two bands to advance to Area this week. At the Area competition, two bands will be selected for the Class 5A State competition against bands from the other seven Areas. Congratulations for the strong showing by a contingent of 25 band members who participated in the State Solo and Ensemble Competition on May 29. All participants earned First or Second Division ratings, which shows a consistent level of high performance that very few other bands can match. Sophia Brinkman, Peter Davies, and Nathan Denman received individual First Division ratings (Gold Medal). The Flute Choir of Erin Harper, Sophie Jejurikar, Caroline Kibby, Jordan Meacham, Katelyn Porter, Ava Sims, Hailey Turco, and Elena Wang also received a First Division rating. Noah Busbee, Bobby Lyle, Gillian Owsley, Allison Walters, and Grace Zhaoreceived individual Second Division ratings (Silver Medal). The Brass Quintet of Christina Bambach, William Cerny, Sydney McDuffie, Jackson Smith, and Allison Walters and the Saxophone Quartet, by Julie Herrick, Jinghan Yuan, Adam Davidson, and PJ Egenes also received Second Division ratings. Special congratulations to Sophia Brinkman and Peter Davies, who earned Outstanding Performer Awards. Only two percent of the 25,000 band, choir, and orchestra entries at the state level receive this designation. Very impressive, Sophia and Peter! A record 62 Highlander Band students qualified for All Region in December, and they performed Friday, January 20 in the Region 20 All-Region Concert, Symphonic, and Honor bands at Duncanville High School. This is 40% of our students and a record number for the Highlander Band. In addition to this, our region is considered the most competitive in the State and arguably the country. All-Region is an individual contest that requires each student to learn three advanced pieces of music and perform them for a blind judging panel, competing against other students from 5A and 6A schools in our region. Of the All-Region students, 18 also earned an Area designation, which qualified them to audition for the TMEA All-State Band on January 7. A record seven Highlander Band students earned chairs in the All-Region Orchestra in November. The band students competed for a spot in the orchestra at Duncanville High School in early November and performed in a full symphony concert on Saturday, November 12th at Conrad High School in Dallas. Band students selected to perform in the All-Region Orchestra are: Sophia Brinkman, flute; Peter Davies, oboe; Jonathan Davies, clarinet; Allison Walters, trumpet; Madison Triplett, bassoon, Cameron Coffey, percussion; and Grace Zhao, oboe. The Highlander Band wrapped up its competitive marching season at the US Bands Season Finale Contest in Midlothian on Saturday, November 5, 2016. The Highlander Band won Best in Class and second overall in the preliminary competition. They also took home the Class Caption Awards for Best Music, Best Overall Effect, Best Percussion, and Best Visuals in prelims. In finals, The Highlander Band performed in Class VI, competing against bands with 70 to 130 more performers on the field. The band placed third overall, being edged out of second place by a tenth of a point. The Highlander Band also earned the Caption Award for Best Percussion in finals. This last performance of “Daydreams of Winter” was the band's very best performance of the season, and they walked away from the competition knowing they’d given their all on the field. The Highlander Band participated in the most rigorous competitions in the history of the band this season. Their unprecedented success was due in large part to the artistic creativity, constant motivation, and dedication to excellence by their instructors: Reagan Brumley, Corey Parks, James LaBrecque, Danny Martinez, and TJ Emsley. We have the best band staff in the country!